Follow the tabs at the side of the page for more information on each category - sponsorship packages, exhibit hall schedule and fees, advertising options, hotel reservation information, and our NEW Corporate Partner Program. WHY JOIN US? 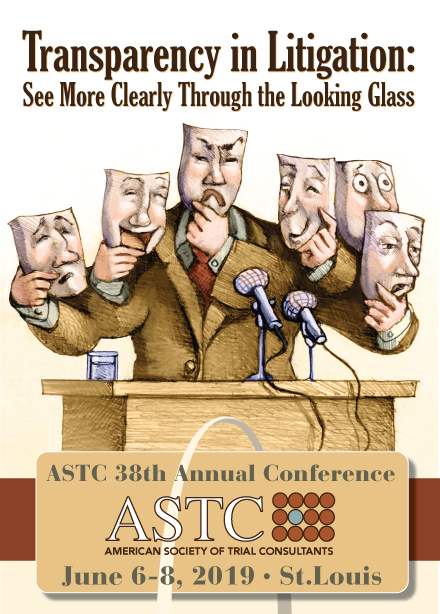 Your support is the lifeblood of the ASTC Conference and the Society. Your sponsorship, exhibiting and conference advertising support contribute to the existence of this annual gathering and the growth of our profession throughout the year. Supporting us gives you and your company recognition to a broad range of constituents related to trial consulting. WE ARE: The goals of the ASTC lie at the very heart of the law's ability to deliver justice. We help litigators become better at persuading jurors and other fact-finders, and that makes the system work in a way that is more meaningful, more reliable, and ultimately more fair. WHO WILL BE THERE: The annual conference participation includes over 125 constituents related to trial consulting.